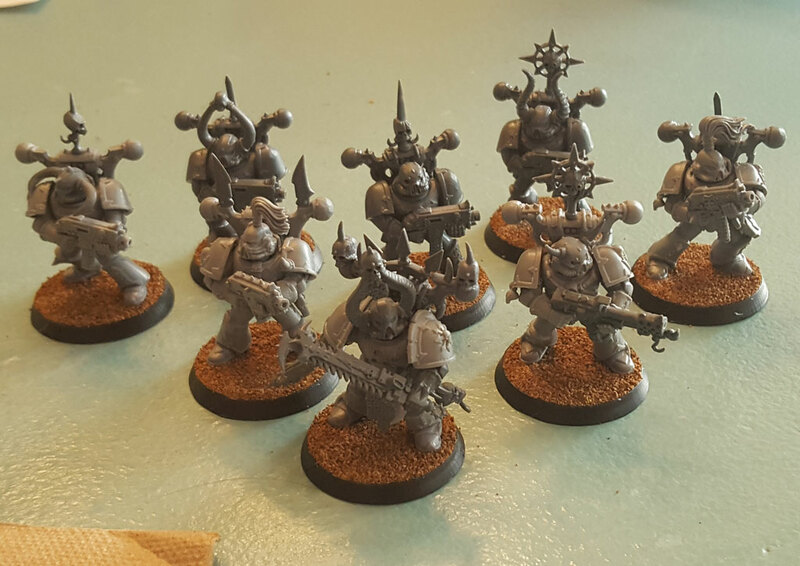 In addition, I also decided to try using some of the extra bits from the updated CSM sprues. I hadn’t done much of that before, mostly out of laziness. But for these guys, I wanted to have a little fun with them. So everyone got spikes or blades. I also made sure most got some kind of skulls, too. 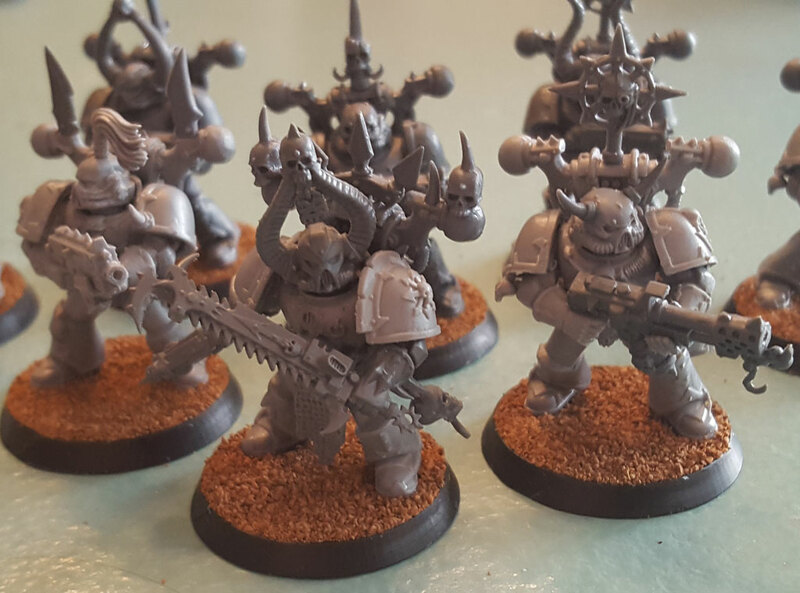 These are Khorne marked CSM after all. I even used a couple of the smaller spikes to add “horns” to one of the CSM heads. I tried to make each head for this squad unique, which was not too hard given the squad is only eight models. Taking a closer look at the Aspiring Champion, you can see I also included some bits from another kit. I really like the arms from the updated Chaos Raptor kit, so I decided to use them here. The arms poses are a bit more dynamic and also have much more detail. Since I’m going to run the champion in this squad with just a close combat weapon and bolt pistol, I thought I’d give him a little more elaborate versions of those options. I also used the updated Khorne champion CSM head. At first, I wasn’t sure if I was going to keep with the smaller 25mm bases for this squad or add the adapters. I decided to go with the adapters as the 32mm base is now pretty much standard for power armor marines. Also, the larger bases just frame the marine models better. So far, I am pleased with how this squad is turning out. I’m hoping to start painting them in the next day or so, though I likely won’t finish them until next weekend, as I’m going out of town this weekend. But given there is a looming deadline, what with 8th edition and all, I can’t wait to get them painted.